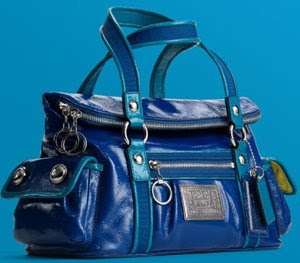 If you are a long time reader of this blog, you know that I like Coach bags, and every so often, even if I'm not shopping for a handbag, I have to take a peek and see if there are any new and interesting models. Right now, the cutest addition to the Coach family is the Poppy Collection. 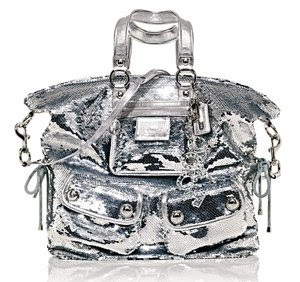 These bags are definitely targeting a younger audience (younger than me, that is), but if you twist my arm, I can find a couple of handbags that I wouldn't have a problem owning (and wearing), like this crazy silver sequined one! Don't ask me why, because I don't know why, but I just love anything that sparkles, and I love handbags, so it only makes sense that I would like the Sequin Spotlight Handbag. And all of the Starlets look very interesting, too, with a fold-over top and their many pockets. Last but not least, I also like the Op Art Glam: simple, roomy and cheap! 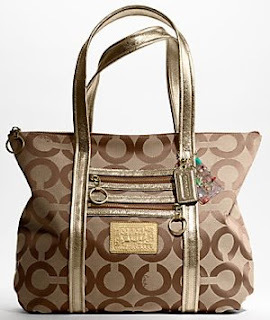 In the words of a friend of mine: I've never met a Coach bag I didn't like. I like Coach bags too. I have one right beneath my desk right now. It's ok as long as don't whip out a credit card everytime I see one that catches my eye. As for the silver one, it's too much for me. My eyes set aglitter by it. But the third one is really cute. I want the pink or silver sequined spotlight sooo bad, wish I could find one because I mainly want the pink one!! !